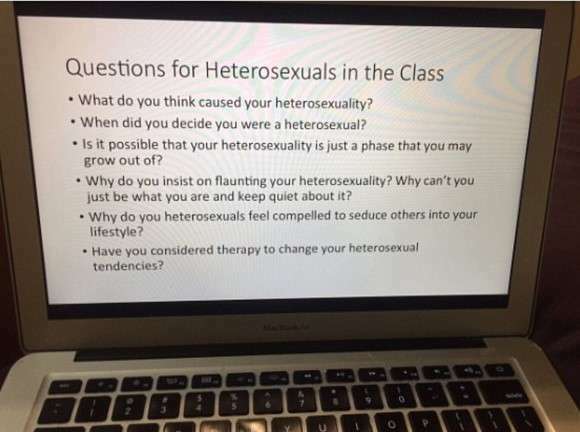 That was just one of many “questions for heterosexuals” a college professor drafted for her students as part of a human sexuality course … a humorous way to make them think about how people are treated based on their sexual orientation. The questions mirrored offensive and homophobic remarks often heard by gay people, which imply that their sexual orientation is a choice, or a temporary phase, or something that should be cured. The majority of Twitter users found the list of questions “awesome” and “brilliant”. “My class was very open-minded about it,” Elise told Seventeen. Elise said she had received concerning messages after sharing the photo of her professor’s list, telling BuzzFeed some people sent her slurs and death threats and threatened to have her professor fired. “I think that a lot of straight people feel victimised by these questions. I don’t think that’s the purpose of the questions at all,” she said.